For entangled particles, “spooky” correlations recognized by Einstein persist no matter how far apart the particles are in space and time. Entanglement is thus among the most fascinating features of quantum-mechanical systems, challenging common sense notions about how strongly the behavior of objects separated across vast distances can remain correlated through time. By following Einstein’s assumptions about realism (each particle has a set of definite properties prior to measurement) and locality (information cannot travel faster than light), physicist John Bell set an upper limit to such correlations in “local realist” theories during the 1960s. Called “Bell’s theorem,” it distinguishes between quantum theory, which allows more correlation than the limit from Bell’s inequality, and the more intuitive local realist theories. 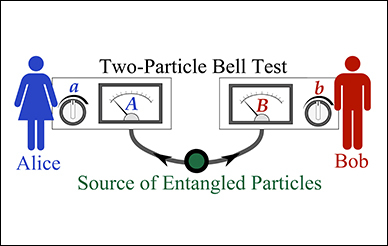 Two experimenters, Alice and Bob (or alternatively, two randomizing devices), each choose (a,b) how to measure their half of a pair of entangled particles. If these choices were not really “free” choices, but instead were subtly correlated with hidden information in the past of the experiment, it would be possible for an alternative theory, distinct from quantum mechanics, to still explain the “spooky” correlations between measurement outcomes (A,B) seen in real entanglement experiments, such as the “cosmic Bell” tests where Friedman and colleagues addressed the freedom-of-choice loophole by randomly choosing measurement settings using ancient light from stars and quasars. Image by Andrew S. Friedman and Jason Gallicchio.